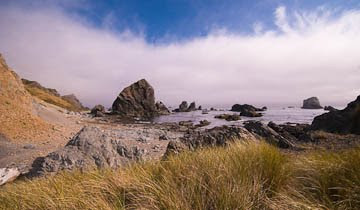 The next afternoon brought a mix of fog and sun at Lone Ranch Beach, located just north of Harris Beach. Microclimates rules here. High cirrus clouds came in and out of view. Most other locations were bathed in fog the entire day. Exploration in a new place is always interesting. 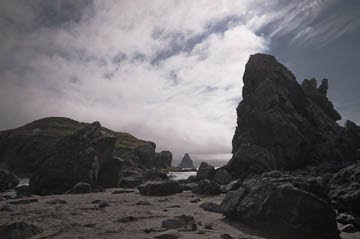 Heading to the north, the beach quickly gave way to a diverse grouping of rocks of surprising variety. The fog was just off shore, but would break to reveal beautiful cirrus clouds. Working with mid-day, stronger light naturally lends itself to black and white. Who says the so-called "Magic Hour" is just mornings and evenings! Another digital darkroom technique is to leave a certain amount of color, with the saturation lowered. With sun shots and back lighting, you can create images that have a somewhat surreal or night time appearance. As the afternoon progressed, the sunlight would soon be disappearing behind the fog. 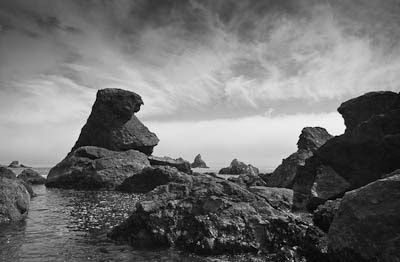 The sea stacks around the point also looked interesting. Better light and an interesting foreground attracted me before the direct, warmer sunlight was gone for good.